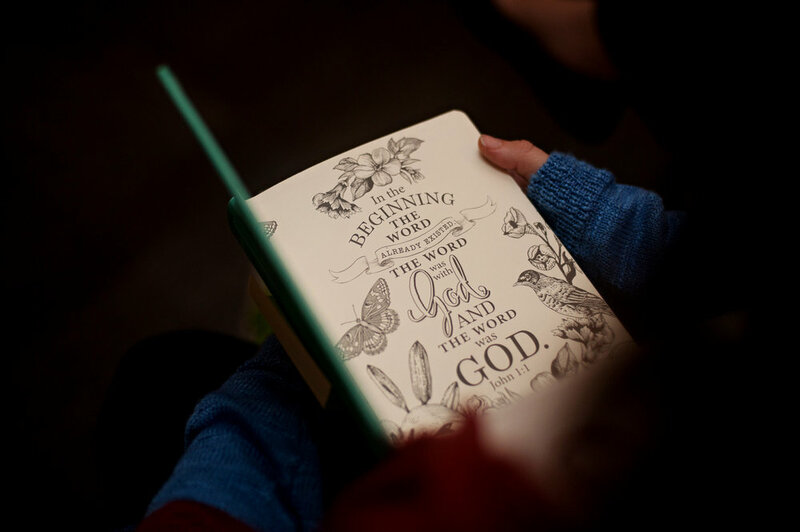 At Grace’s Table, Tuesdays are for teen mamas exploring the Bible together. Over the past two years, the interest in and attendance at these Bible studies has grown. Grace’s Table moms are digging in deep and asking big, tough questions, and God is revealing His goodness in awesome ways. This year, one mom started coming to Bible study unsure, really, of what she might find. She’d been to church a few times as a child and knew Jesus died. But when asked if she knew what happened next, she stared blankly. Thanks to Grace’s Table, this mama now knows that Jesus is not dead, but is living and active. She’s learning to believe He loves her and has a plan for her. She uses the materials she accesses through Grace’s Table to feed her growing curiosity and to teach her little boys about Jesus. They are learning together. 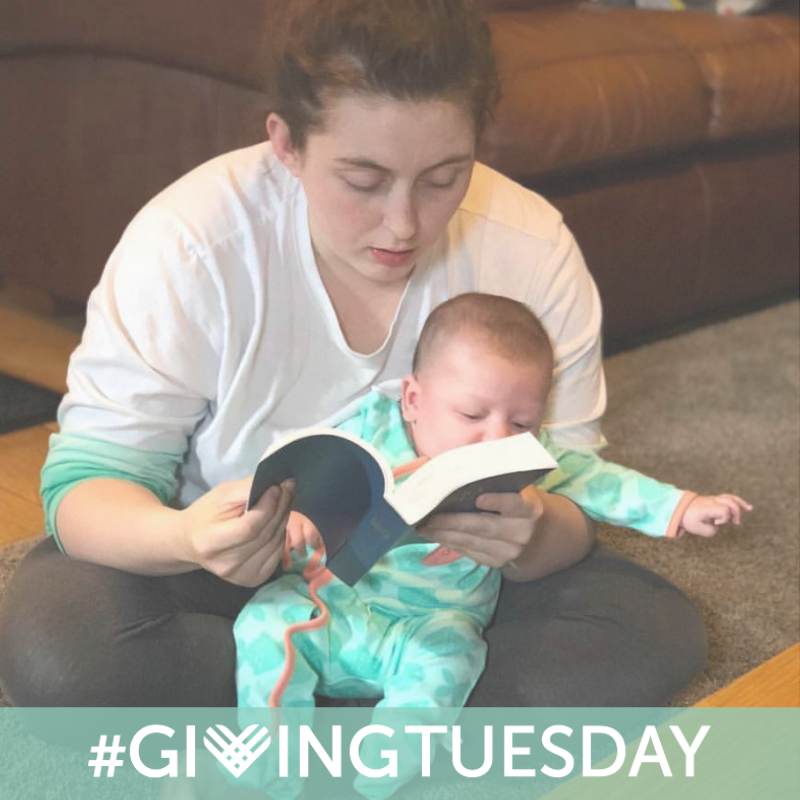 Will you join me in giving sacrificially to help Grace’s Table reach more young, curious women through the Word and through a safe community in which to explore and ask questions? At Grace’s Table, we’re all about SPACE. Space is what’s provided for teen moms and their littles — space free from judgement, space to have their basic needs met, and space to belong, to grow in community with one another and to grow in depth within their own personhood and family unit. “SPACE” is also the framework for this growth at Grace’s Table. By focusing on five key areas — Spiritual exploration, Parenting, Adolescence, Career and Education (SPACE) — Grace’s Table helps young moms (ages 13-24) realize their value, explore their purpose, make important decisions and become the women God created them to be. To continue changing lives, though, Grace’s Table needs more physical space. They’re growing and have maxed out the ways its existing property can be expanded and utilized. AND, there’s a HUGE unmet need for providing stable housing for families during difficult times, or as mamas are getting on their feet. In 2017, we completed a construction project, and the basement of our current location was finished to provide a safe play area for children, as well as a bathroom with a shower and a laundry room for families to use throughout the week. The children’s play area freed up space upstairs for more moms to gather on Friday nights for “Around the Table” and made it possible for Grace Table’s to offer a permanent Tuesday night Bible study for moms (previously, it was offered just a few times a year). (Watch the video to learn more about the last expansion). The response to this new space was exactly what we had hoped: moms are coming to Bible study, using the laundry and bath facilities, and more women and children are being served. On any given Friday or Tuesday night, it’s not uncommon to have 10-15 moms, 15-20 children, and 5-10 mentors and volunteers gather for dinner in an 800-square-foot space — and they’d love to be able to invite more families! Except, there’s no room. A new property has been located that would allow for expanded programs and services — AND meet that HUGE need for housing! Together, we are raising money to impact more families. Together, we can do this! Help us today to provide more SPACE for grace! Through the support of Grace’s Table teen mothers find the SPACE they need to make important decisions, take next steps, and flourish into the young women God created them to become. Girls find hope, realize their value, and explore their purpose within the context of a healthy community. We do this with a holistic approach, keeping the whole person in mind: Physical, Mental Wellness, Social, and Spiritual. Let’s take a look at Spiritual Exploration. Dana committed to her spiritual journey this year. She attended church a couple times as a child, and she knew Jesus died. This she was sure of. We asked if she knew what happened after that and she stared at us blankly. Friend, he’s not dead! There’s so much more to the story we told her. You should have seen the look on her face. Since that day she asks a lot of questions about the Bible, about Jesus, and tells us how the text we are reading applies to much of what she is experiencing. She feels comfortable to explore and ask questions. Something has been awakened in her heart. She uses the materials she accesses through Grace’s Table to feed her growing curiosity and to teach her little boys about Jesus. They are learning together. Everyone is excited to start our next Bible Study and use the new journaling Bibles they received for Christmas. Dana’s already started coloring her Bible and wants you to know that she is going to have the prettiest one! “The Creator of the Universe is madly and passionately in love with YOU”. If time stands still, it most definitely did in this moment because you helped give her SPACE on her spiritual journey, and she’s experiencing the love of Jesus because of your generosity. Having the necessary space and access to resources to help moms like Dana is crucial to the Spiritual exploration process. With just days left to give in 2018 I am asking that you give a sacrificial year-end gift to provide more girls the SPACE they need to explore spirituality, and embrace the truth written just under the cover of the Bible they now hold in their hands. Every mom needs a Grace's Table in their life! Earlier this week in the midst of a meeting my phone started blowing up! Text messages, emails, facebook messenger. Someone was using every avenue they had to get my attention. It was one of the Mamas who has found belonging at Grace's Table. She said, “Something told me I needed to share this with you today". And something tells me I should share it with you. It is your support that has made this possible, and it is your ongoing support that will make it possible for more teen mothers. Why do I attend Grace’s Table? Why have I stayed a part of this community for YEARS? I always say food because it’s the frosting on the cake. It’s the simple answer. Like who doesn’t like the frosting? LOL but seriously, it is! Our food partners are great! I don’t remember a BAD meal in my 4 years of being a part of the Grace’s Table “originals”. ANYWAYS, why do I attend Grace’s Table? Because the support I have there I have NEVER had ANYWHERE. Not family. Not school. Not a relationship. Literally no where! It’s the family I never had. Families have bad times, and there has been bad times. I don’t agree and get upset, but it’s not because anything wrong was done. It’s because I didn’t want to hear it. Even though it was the truth or what was best. I felt most connected to my Grace’s Table family when they helped lay my other half (my kids’ dad) to rest. Not because of the financial support, but the emotional support. They came to his funeral. Even some of the other moms of Grace’s Table came to support me. They helped get my girls and I necklaces with his ashes in them. Just a lot of support during the hardest part of my life. They were also there for me when I came into some legal trouble and they supported me in the way I needed at the time, and after they helped keep me out of that trouble. This fall I completed my GED and will be the FIRST generation of my family to go to college!!! If Lisa and Jess, my mentor, didn’t push me to do that I probably still wouldn’t have it. This community is EVERYTHING to me and what I named here is not even the second layer of my cake. Every mom needs a Grace’s Table in their life! When we connect with a girl between the ages of 13-24 who is pregnant and/or parenting we meet her where she is at and we begin with the base layer of the cake. Or as in the story above, we start with frosting :) You put a little frosting down to stabilize the cake. (You're welcome for that baking tip.) Seriously though, we begin with meeting basic needs like meals, diapers, safe transportation, and we build from there. Pictured above are the 5 key areas where we meet young mothers on their journey from adolescence to motherhood. There are a lot of ingredients in this recipe, and a lot of people who make it possible. People like you and me! Below are the some of the ways our moms and kiddos would describe our "cake". In the story above you heard this Mama mention that she is a "Grace's Table original". Since she used the analogy of a cake, it seemed appropriate to use a birthday cake to describe a few of the things we do at Grace's Table. December 8th is our birthday! It is the day we officially became an organization in 2014, but we are not just an organization. We are a family, and families take time to grow. Thank you for helping us grow! We absolutely love these families and are so grateful to be able to share a story of impact like the one above. Today I am asking you to Be the One. It will change the future of unborn children and their mothers. For a moment, I want you to focus on just one girl. Angel is 15 years old. She has suffered unimaginable trauma and every day she finds herself lost in her thoughts longing for a way out, hoping to one day know what it feels like to be loved and belong. Her frame is childlike with the exception of her protruding belly hiding under her sweatshirt. Today she learned two earth shattering truths: she is pregnant with twins; and her Granny kicked her out. What now? Grace's Table offers pregnant and parenting girls between the ages of 13-24 a safe harbor, an anchor in the storm, for many like Angel, it's a literal life line. We focus on five key areas with each girl: self-discovery, motherhood, education, career, and spiritual exploration. Will you Be the One to say yes to Angel and her twins? We are looking for 50 people to partner with us monthly. Your monthly gift of $83.33 ensures mothers like Angel receive quality care as they navigate adolescence and motherhood. Each mother will receive personalized care and case management, along with incredible life skills courses to help them grow both individually and as a mother. Will you be the one? This year 100% of the moms that were working on finishing high school completed their education. 50% are working with mentors to begin college in January. When you say you want to BE THE ONE, you are ensuring she has the resources she needs to focus on her education. Sometimes that means mental and emotional support, and other times it means physical support. Your gift of $1,500 ensures a girl like Angel can access professional counseling and ongoing care throughout the year. Your partnership means a brighter future for young families. Will you be the one? Grace's Table is a place of belonging before believing. You've heard us say that Tuesdays are for Teen Mamas and on those nights we are exploring the Bible. A young mother recently shared she likes Tuesday nights because she can stop in the middle of the study and ask questions. She is learning through reading the Bible, journaling, and activities that help her relate to the text. Will you ensure that Angel has the opportunity to understand that God is for her and her babies? Your partnership makes an eternal impact on everyone who sits at Grace's Table. Will you be the one? You've read about a lot of support that Grace's Table can offer Angel and girls in our community who find themselves pregnant or parenting, but Angel needed something more. A place to let the dust settle, to stabilize, and where healing can begin. She needs shelter. Home. Housing has always been one of our goals. If you would like to play an even bigger part in the vision of Grace's Table please reach out and let's connect to discuss what the future holds. It's pretty exciting! Thank you for your generosity on this #GivingTuesday and every day! Grace’s Table is a tax-exempt 501(c)(3) nonprofit organization.